Civil engineers and surveyors create maps to represent properties under development, such as subdivisions, skyscrapers, and commercial properties. Maps require bearing-distance line labels and radius-delta-length curve labels, and often tables. Mappers must decide which label style is best for each parcel segment. This process is time consuming and prone to errors and omissions. Pemulis Map Maker eliminates the labor and potential errors associated with this process. 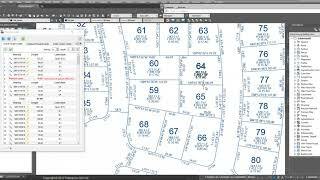 Pemulis Map Maker creates Autodesk® AutoCAD® Civil 3D® labels for Civil 3D parcels, and Pemulis_Labels for all other entities, using the most appropriate label style given how a particular parcel segment is being used. For example, a 100 parcel subdivision can be fully and correctly labeled in seconds - overall and partial parcel segments correctly labeled. Which Civil 3D label styles are used are decided by ... you! Send support email for Pemulis Map Maker to Enterprise CIOs. Pemulis MapMaker defines and creates parcels, labels and tables, and creates reports from CAD drawing geometry. To uninstall use Windows Control Panel Program and Features, select Pemulis Map Maker v10.06 for 2018-x64 and select uninstall. The app does require an internet connection the first time it is run. The application comes with a 30-day trial license upon first run (installation required), which can be extended at the publisher's discretion. A license key is emailed to the user when purchased. Includes labeling for Autodesk AutoCAD Civil 3D® parcels, and full import/export of Civil 3D parcels to/from Map Maker.